By Jkhorton, June 23, 2017 in New Member? You know google images isnt half bad. Just type in what ever ship name and plans and something Ussually comes up. At our scale images online can work fine. Here's one for the Golden Hind. Ive thought of doing this ship. I agree with Daniel. There are many sites with drawings on the Internet. But I think that first you can determine the type of ship that you want to build. For example, it could be a schooner, a yacht, a caravel or something else. Then it will be much easier to find the drawings. I would recommend something like the above coasting ketch to begin with, as merchant ships are far less complicated than warships, not having guns or much in the way of decoartion. Sadly, they are very unpopular though. You also can take as a sample some famous schooner. For example, America or Bluenose. 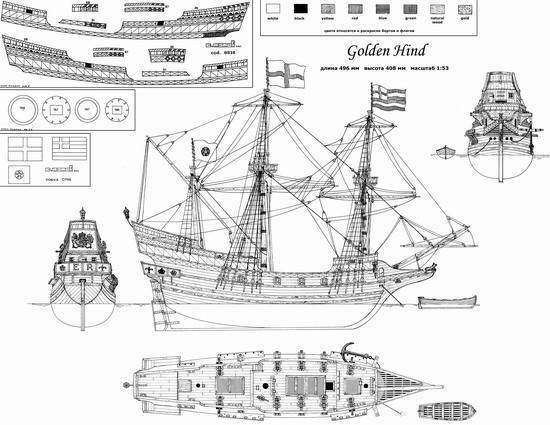 And there are the available plans of these schooners. For a good beginning model look at sloop. Bermuda sloop are fun if you like something with cannons. They're a good start because they only have one mast.